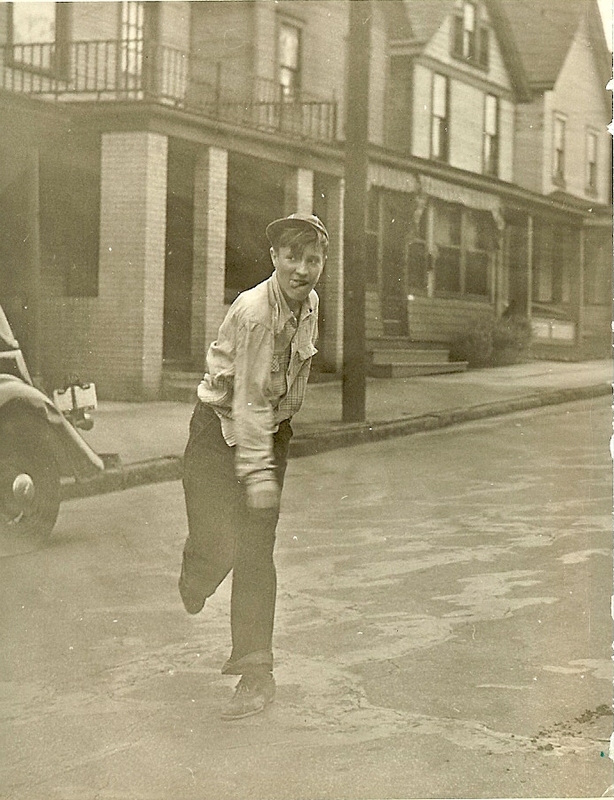 My dad, Ralph, was born on March 10, 1931 in Donora, PA. He would have been 80 years old today. My dad adored my mom. 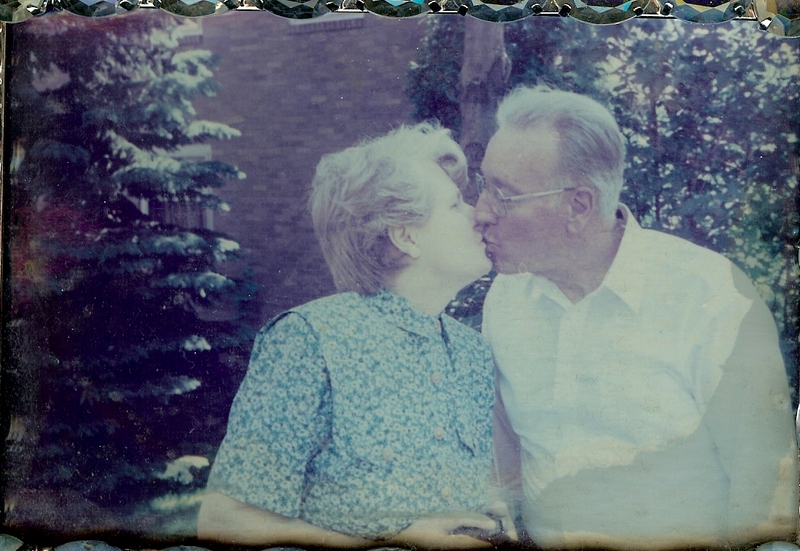 Toward the end of his life, he shared with me that after nearly 40 years of marriage, he still couldn’t get over the fact that such a beautiful lady had been interested in him. 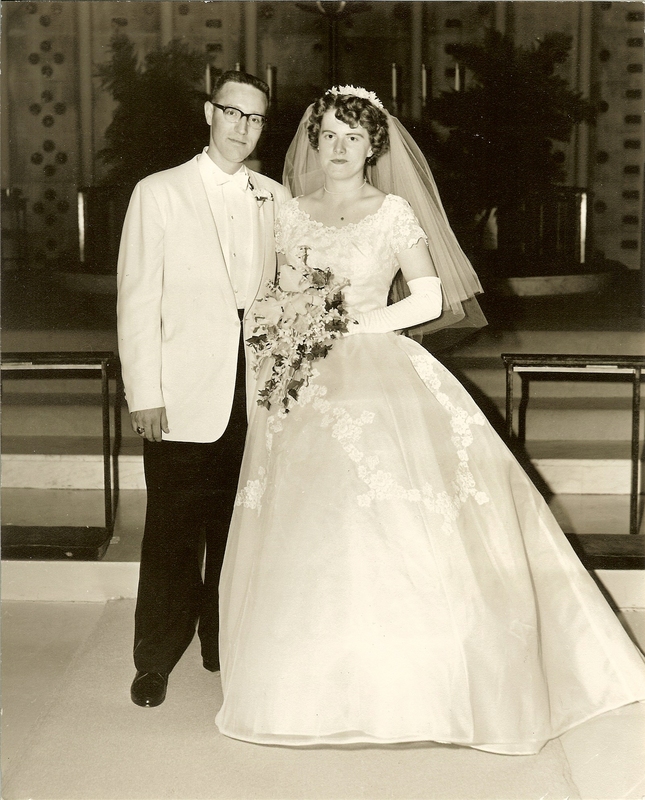 I can still remember the faint sound of wonder in his voice and the faraway look in his eyes as he recounted their wedding day. It was such a sweet moment. 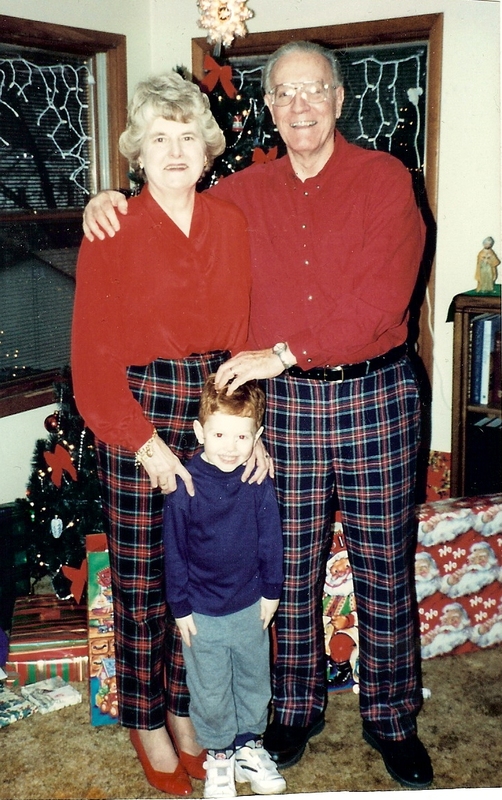 Another thing my dad was famous for was The Christmas Pants. Anyone reading this who shared holidays with us is smiling right now because this was always a highlight of the day. 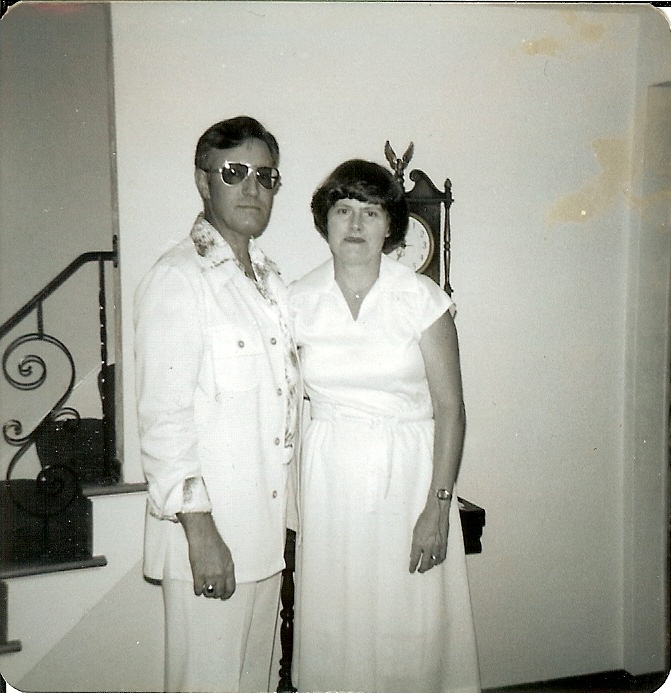 My dad was well-known for being a snazzy dresser. (with the exception of the above 70s photo, obviously). However, on Christmas Day 1987, he made a huge fashion faux-pas when he inexplicably decided to wear plaid pants paired with a shirt that had a wide horizontal stripe emblazoned across the chest. We were all incredulous that he would wear that shirt with those pants and teased him mercilessly all day long. By the end of the day, he vowed that he would wear those same pants every Christmas for the rest of his life…and he did! 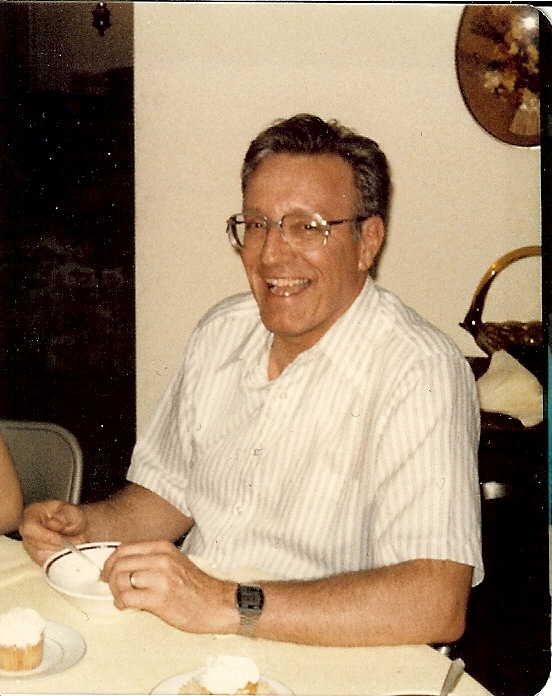 In 1994, Dad retired as the head of human resources for a branch of the Department of Energy. He was deeply respected by his co-workers as a man of integrity, who was tough but fair, and saw and nurtured potential in his employees. He was excellent at his job because he was deeply perceptive. He could read people like no one else I’ve ever known. Within five minutes of meeting anyone, he had their number and he was always right. It was almost eerie. 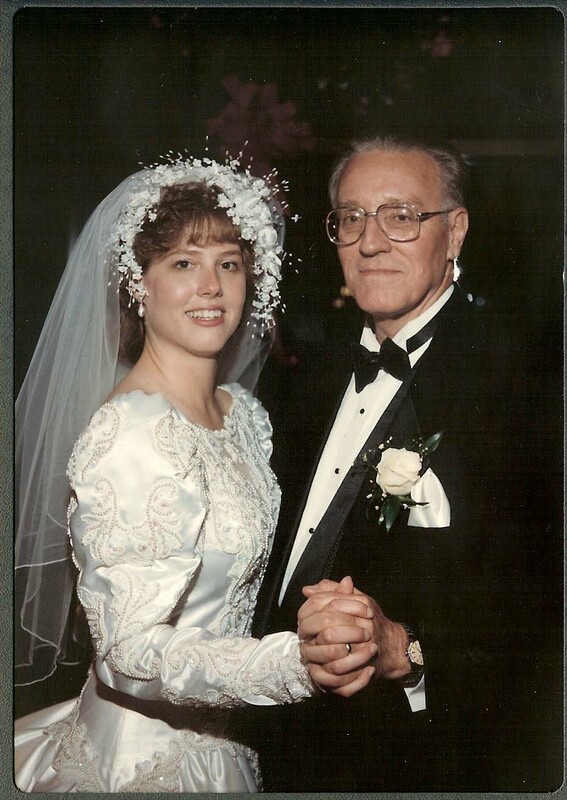 Dad was so proud to walk me down the aisle. He knew I would be in excellent hands. One of the great joys of Dad’s life was becoming a grandfather. Julia had him totally wrapped around her little finger. 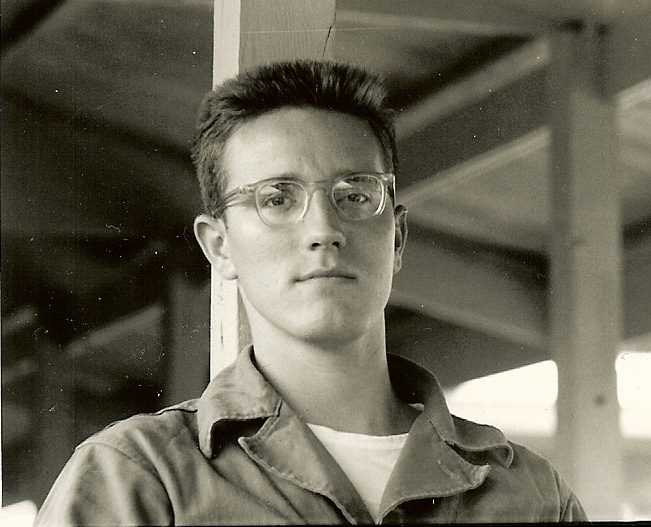 In 2002, my dad began to experience shortness of breath, so he went to the doctor to have a stress test. The results were shocking. Only 20% of his heart was working. None of us could believe it. 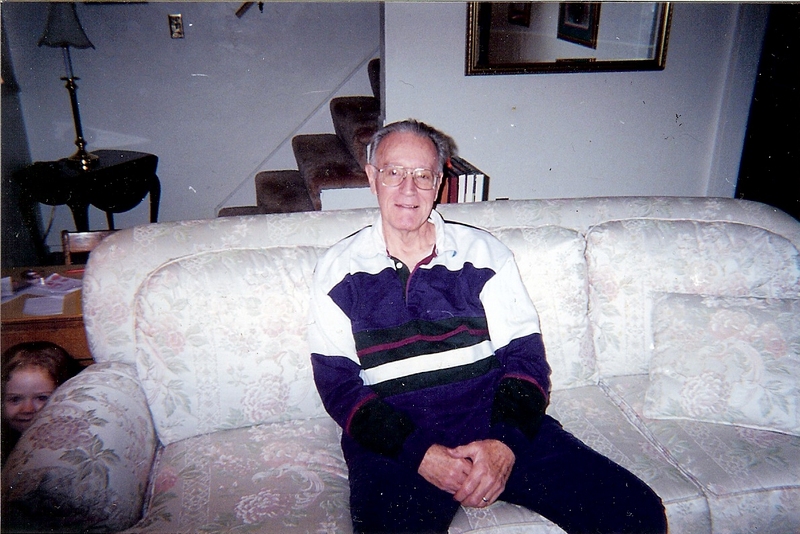 Dad was a lifelong health nut…he exercised daily, watched what he ate, and took a ton of vitamins. He was the last one we would suspect of having a bad heart. This was on a Friday and the plan was for Dad to have a bypass operation first thing that Monday morning. We were in New Hampshire and couldn’t get home to Pittsburgh in time. So, that Sunday night, Dad and I had a tearful phone conversation. Knowing the risk of surgery, we didn’t know if this would be our last conversation, so we said everything that needed to be said. At one point, I told him that I was pretty sure I needed him on earth more than Jesus needed him in Heaven. He never did have the surgery. Once in the operating room, they realized that his heart was so badly damaged that he would not survive an operation. So, they sent him home and put him on a regimen of strong drugs in hopes that those drugs would build his heart up to a point where he could have a bypass. He was released the week before Thanksgiving, so Doug and I made the decision to take the kids and go home to Pittsburgh for the holiday. We spent all of Thanksgiving week staying at my childhood home. 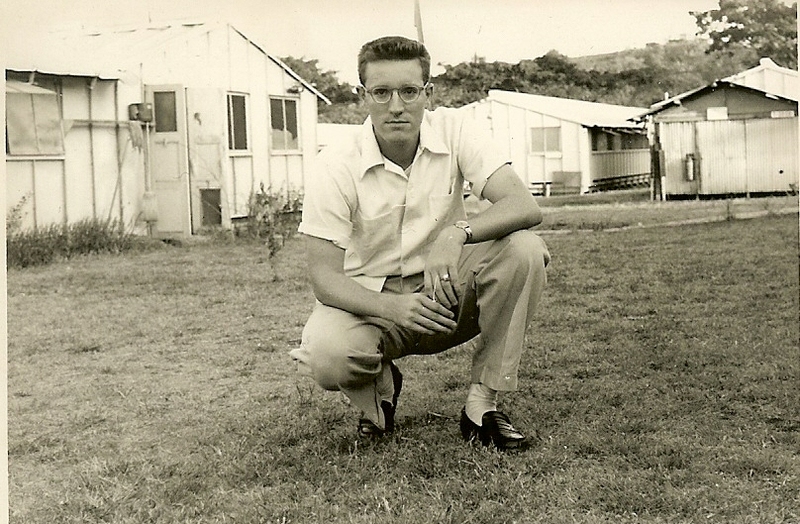 My dad looked more frail than he ever had but he was in excellent spirits. It was a wonderful week. 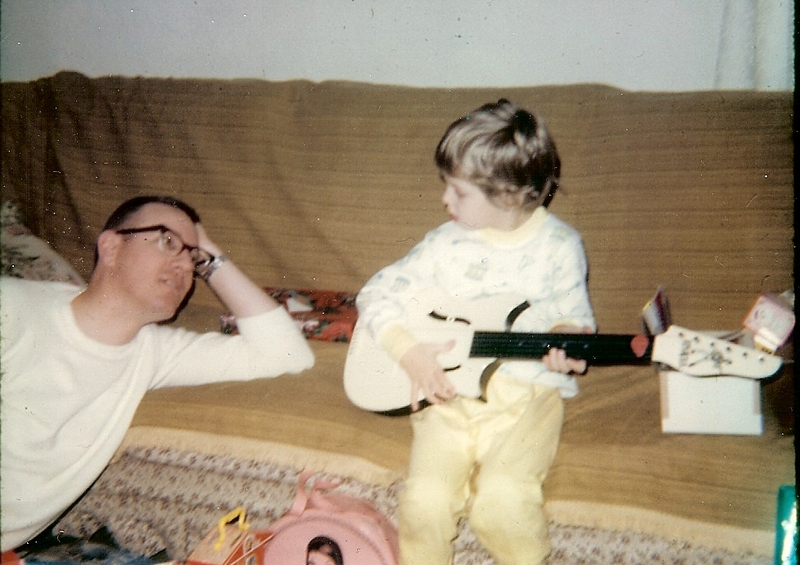 I spent a lot of time with Dad. He shared memories with me that I had never heard before and I asked him a million questions. I think that deep down, we all knew time was short. Thanksgiving Day dawned bright and sunny and to this day, I remember the laughter. We laughed all day long, especially after all the relatives arrived. I had the videotape going all day long, intent on capturing as many moments as I could. When I watched that tape later, I could see that Dad was quieter than he usually was. At one point, I left the machine running as we sat around the table. I didn’t notice it at the time, but the tape revealed that as he sat at his customary spot at the head of the table, he eyes rested purposefully and thoughtfully on each face, as if he was trying to memorize us, especially his grandchildren. He smiled at me, shook his head, and said, “Let’s not say goodbye. Let’s just say ‘see you later’. '” He told everyone that he loved us and we were on our way. That was the last conversation I had with my dad. He had a massive heart attack later that day and never recovered. My mom later related that as he had finished his breakfast that morning, “Amazing Grace” came on. He listened for awhile and said, “I love that song” before going into the family room for the final time. And it is precisely because of the amazing grace of our beautiful God that I will see my dad again when we meet in Heaven. He has been gone for nearly nine years now and I miss him everyday. I miss his sense of humor, his advice, his stories, his seemingly endless knowledge of trivia, his incredible wisdom. To this day, I regret that I didn’t speak at his funeral. I wanted to but I just didn’t have it in me at the time. So, this is my way of honoring my dad’s memory in a way that I didn’t get to do on that day. The most amazing thing happened just as I was finishing this post. My dad loved to sing. He had a deep, rich voice and he sang constantly. One of his all-time favorites was the classic song “Smile” by Nat King Cole. I have so many memories of him singing that tune. I froze and immediately began to weep. It was as if Dad had literally just walked into the room. The TV singer’s voice faded and all I “heard” was my dad singing. I just sat still and let the tears fall. You’ll find that life is still worthwhile…if you just smile. Happy birthday Dad! I love you. And I can’t wait to see you again.